Taking on new creative challenges continues to be one of my goals because I find they all feed each other. Last February, I was gearing up for my first Stand Up Comedy performance. Truly terrifying and exhilarating. 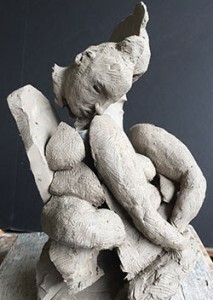 For the last few weeks I’ve been trying my hand at sculpting a live model in clay. I’ve never done this before. It was totally frustrating and often boring. In the final session this week, I finished the sculpture and then spontaneously decided to cut it up. During the process of what I call Creative Destruction, I discovered something far more interesting than the representational sculpture. And, I had more fun than I’d had all the previous weeks. This got me thinking that sometimes you have to destroy something, even if you’ve worked hard on it. In the destruction, you allow for something you never could have imagined, and possibly even better, to come into being. You create something new and delightful. Or you create something that isn’t. And you destroy (or modify) it again, and keep going. At 56, I need to surprise myself to stay creative and engaged with life. I need to “bring the joy” as one of my mentors says. Home Stagers, have you had any challenges in this area? Does any of this resonate with you? If so, let me know. I’m thinking of exploring these ideas further in a series of articles. Recipients of the 2016 Houzz Customer Service Award: Sharon Stauss of Style with the House of Strauss (AU), Mary Ann Benoit of Northern Lights Home Staging (AK), Victoria Guillot of Stage Coach Services LLC (PA). If you won something too, please let me know. I’d like to write a larger article to celebrate everyone. The “spring” real estate season has already started here with phone calls from clients who want their homes staged before going on the market. Has that been happening for you too? If you’re already in your home staging business, please make sure that potential clients can find you. If you haven’t started your staging business, remember this is the busiest season of the year and it’s not too late to learn what you need to take advantage of it. 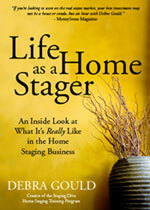 You’ll learn how to join me at the “Water Cooler for Home Stagers,” aka Staging Diva Dialog on February 17. It’s an awesome group of home stagers who are at various stages of their business. It was on last month’s call that I learned Mary Ann and Victoria had both won the Houzz award. Don’t worry, you don’t have to be an award winning home stager to join us, we have total beginners too. Staging versus Decorating: What’s the Difference? Wishing you every success in your home staging business, and this bigger thing called life. Let’s make 2016 awesome, shall we?